When trained fingers touch a musical instrument, what resonates out is enchanting melodies. This was true of Karnataka’s senior flautist Shaikh Abdullah Khazi, whose unpretentious approach to instrumentality and virtuosity lent a soothing melodic treatment to the discerning listeners and connoisseurs of Hindustani classical music. His recital was hosted by S.G. Balekundri Institute of Technology at its campus in the city on Friday evening. He was accompanied by Belagavi’s percussionist Narayan Ganachari on Tabla and supported by his disciple Jahanvi Joshi from Hubballi-Dharwad on flute. 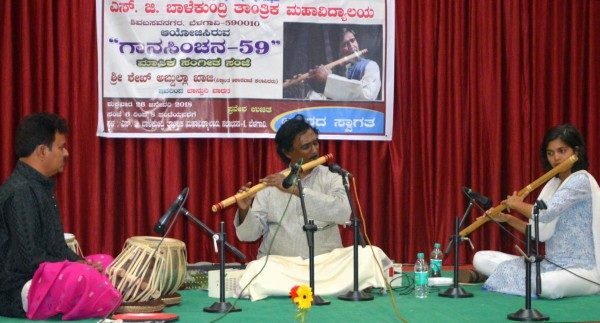 Belagavi, Jan.27: Soothing melodies: Senior flautist Shaikh Abdullah Khazi, accompanied by Narayan Ganachari on Tabla and supported by his disciple Jahanvi Joshi performed at S.G. Balekundri Institute of Technology in Belagavi on Friday. Taking off on the pleasant and heptatonic-scaled yaman raag for the evening session, the flutist started unfolding the melody over an unhurried alaap, emphatically signifying each note and phrase, and the beauty of the interludes between the melodic phrases highlighted by fine meendkari and clear murkis on the bamboo flute. A strict disciplinarian when it comes to the classical music, Shaikh Kazhi restricts himself from indulging in what some describe as gimmicks and exaggeration. Rather, he would delineate the melody through brief and medium length phrases where various permutations and combinations are crafted within the precincts of the well-defined grammar for interpretation and raagdari. Having gracefully established the majestic and devotional mood of yaman, the alaap, followed by a brief jor, was essentially a reflection of the flautist’s simplicity, his candidness and artistry. Apparently, the ambience was filled with pure music. The following gats, set to madhya-laya and drut-teentaal were testimony to his unflinching control over laya and perseverance to be in tune with the swar and laya. In sum, his flute recital was marked by pure form and content scripted through clearly reverberating swaras. The only thing that was disappointing, as usual and as it happened with other artists who have performed here was inefficient audio-system facilitated by the host institution unwitting casting a shadow over such music concerts. Paying his befitting tributes to the freedom fighters on the occasion of the Republic Day celebrations which coincided with the 59th Gaanasinchana, a monthly music programme initiated by the SGBIT to promote art and culture in its campus and society, Shaikh Khazi played the Mahatma Gandhi’s one of the favourite bhajans ‘vaishanva jana tho tene kahiye…’ followed by another devotional composition ‘payo ji meine ram ratan dhan payo…’. He concluded the session with the popular melody ‘vathapi ganapatim bhaje…’ composed in Carnatic raag hamsadhwani. Percussionist Narayan Ganachari was all thrilling with his brief laggis, todas and tihais he rendered snatching time to elevate his rhythmic support, while the Jahanvi’s candid support was an indication of her disciplined learning of music and flute. EOM. Shaikh Abdullah Khaji was born in Karadi of Bagalkot district in a religious and a spiritual family known for its folk literature, music, drama, lavani-singing, creating and singing rivayat poetry. His family, gifted with traditional ayurveda practitioners, also has a noble tradition of giving free medicines to the poor patients. After his graduation in Arts in Kannada from Government Degree College, Sindur, he took to flute sometime during 1971-72 under the tutelage of famous flautist Pt. V.N. Badi for eight years. As his devotion and passion for the Hindustani classical music and flute kept on growing with the passage of time, he went under the discipleship of the doyenne of Kirana gharana late Padmavibhushan Gangubai Hangal for higher lessons. It was under her that her that he learnt the finesse of the alaap and development of the raag in gayaki style. It’s true that he was taught only one raag during his eight years of learning under his Guru. But, that was the window to all other ragas, says Shaikh Khazi. · Kundagol Savai Gandharv Sangeet Mahotsav. · Doordarshan Bengaluru, Gulbarga and Delhi. · Bhopal (M.P.) Sangeetotstav – 1995. · Hyderabad Sangeetotstav at Sangeet Mahavidyalaya, Secundarabad. · Poona Sangeet Sammelan – 2007.